Megs made a tremendous comment on my last blog entry... mentioning Jared Padalecki as a possible Jamie Fraser. He's from one of my favorite shows of all time (until the writers went and lost their damn minds and messed with the perfection that was "SUPERNATURAL".) I know, I know, he's not Scottish - or even English or Irish for that matter... but just take a look at the photos over at MyOpera.com. Even if you still dinna think he has Jamie possibilities, it will be a lovely minute or so for your eyes. He is so much more attractive now than he was on Gilmore Girls! Oh, dear... I have a new crush. I watched some videos of him being interviewed, and he is so completely adorable. And at least he can act! Isn't that one of the main things people are worried about- if we get a Jamie that canna act? Tell me more about supernatural, I've never seen more than 30 seconds of it. should I rent the seasons? Oh, that was a great minute. If he lived in the present day, Jamie would totally be a no-nonsense gray tank top and well-worn jeans kind of guy. Sigh. He is amazing, granted, but still I don't see a Jamie. I don't think i'll ever find a Jamie haha! This guy could maybe be young Ian... or even Old Ian... or Fergus... or William... or even Denny Hunter (I kinda have me a little Quaker when-the-spirit-moves-me sorta crush on him too!) - ok, I know I'm gettin ahead of myself. One book/movie at a time. Seriously--this is like the BEST idea I've had all year. ROFLMAO. Christie - He's not my perfect Jamie, no. I was trying to illustrate Megs' comment from yesterday's post. Although I will say this - Jamie had a "bronze" tan from time to time...which has always led me to believe he's not an extremely fair redhead. Tracey - I. LOVE. It!!! When do we start production?!? No, not Jamie, but verra verra nice, indeed! I agree he has nice hands..
Oh,oh! 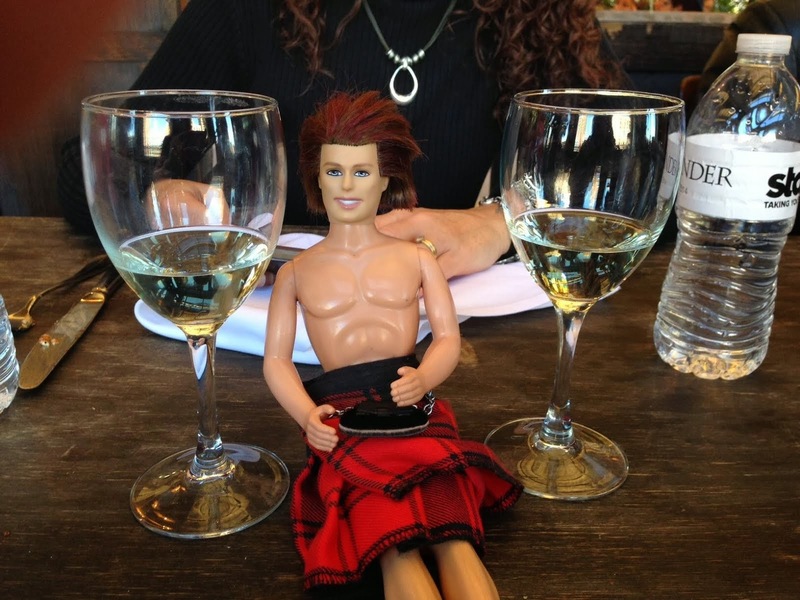 Can I be a guest judge on "So you think you're Jamie Fraser"? OK, Trace, I'm wit ya on dat, dog. You are officially the executive producer. I wanna be the scout - you know, the Ryan Seacrest (is that how the dude's name is spelled?!) that all the contestants have to go through before they parade themselves in front of the judges!!!! Forget the "scout"; I'll be the Claire stand-in (like in the old fashioned screen tests, you only see the back of the other actor) while all the Jamies act out the "I canna be gentle about it" scene!! See? We all have our jobs! Tracey, Stacey, Christie... sorry, Carol - your name doesn't rhyme! OOhhh do I want that show!! What a great idea Tracey. Totally on board with the show. If I go by "Meggie" Can I be a judge since that will rhyme? Hahaha, jk! I was just trying to point out the biggness and cat eyes! I think that he has those Jamie attributes down!! In order to find our "perfect" Jamie, we may need to cut and past ken? But, I think that He's 6'4"? I watched this video of him talking about how tall he is (Random, I know...) Watch how he talks! So adorable and Jamiesque- A little cocky maybe? OK, lassies, I have refined the idea for the show (which is now going by "So You Think You Can Play Jamie Fraser?") It will be a cross between American Idol/Dancing with the Stars and Project Runway/Top Chef. • There's a host and four judges. HERSELF, as we've determined, is head judge. Maybe the movie screenwriter (whoever that may be) is second judge. Still haven't determined the third judge. Then there's the special guest MOP judge, which features a rotating cast from our own ranks. • The search begins with casting calls in three-four cities, like on American Idol. (Edinburgh is one of those cities.) That's where we have the first few eps that feature the auditions of bad, laughable Jamies. From these auditions, the field is narrowed to maybe 20 potential Jamies. • After the final challenge--voila, we have our Jamie!!!! So whaddya think some appropriate Jamie challenges might be? What a great show! What challenges, Tracey? Proper Jamie necessities, like broadsword and dirk fighting? Then perhaps a "melt the judges" contest, where they must deliver the most smouldering Jamie one-liner. What could that be?? ?